Keira, my niece, was born February 19, 2011, with two holes in her heart, one an Atrial Septal Defect and the other a Patent Ductus Arteriosus. 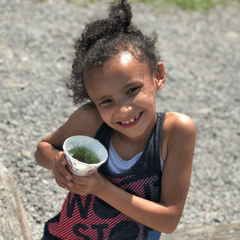 Just over two years old, through routine lab work, Keira was referred to a gastrointestinal doctor at WVU Ruby Hospital for elevated liver enzymes. Keira’s dad and my brother, Anthony, was born with the same two heart defects. Anthony’s were repaired when he was two months and at three years old. He also had a pulmonary stenosis defect that was routinely checked every year until the age of 18. Keira was assumed to have hepatitis because of her dad’s addiction to drugs, but after numerous labs for hepatitis they repeatedly came back normal. Over the next several months additional lab test were done and, again, all were normal. One last test remained, Alagille Syndrome, a genetic liver disease. While reading the description online, I immediately believed I was reading Keira’s symptoms. Broad forehead, narrow chin, high pitched voice, and heart defects to name a few. I informed her doctor of my concerns and they agreed. Insurance denied the test because there wasn’t enough proof to justify. After another year, and several denials from insurance, our next step was a liver biopsy. Results came back as we suspected, fewer bile ducts than normal. At this point, we were able to treat Keira with medication and after one year on the meds her liver enzymes were back to normal. They’ve remained that way since. We follow up routinely at WVU Ruby Hospital every six months, have routine labs and ultrasounds, plus take daily meds. Keira’s main problem has been itching even though all her labs have been normal. We’ve changed medications that work for her and at this time her itching seems to be controlled a little better. Keira’s dad passed away in 2016 from a drug overdose and through an autopsy it revealed he had moderate stenosis of his aortic and renal arteries. Her dad wasn’t diagnosed with Alagille Syndrome, but all the signs were there. Keira had testing for all of her vasculature because of the autopsy results from her dad, and at this point she shows no signs of narrowing in her arteries. Keira lives a normal lifestyle with me and my husband and two sons. She is active, and we remain hopeful she continues a healthy life.